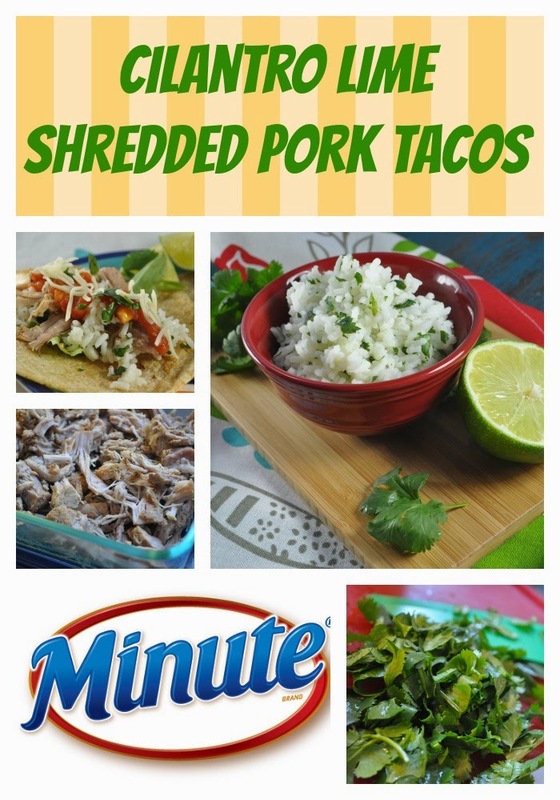 Recipe: Cilantro Lime Shredded Pork Tacos with Minute® Rice + Giveaway! | The Food Hussy! Recipe: Cilantro Lime Shredded Pork Tacos with Minute® Rice + Giveaway! This spring I love having light and healthy dinners that can mostly be done on their own! The crock pot is still your BFF - even as the weather gets nicer. Today's recipe has a delicious Cilantro Lime rice thanks to Minute® Rice! I found some country style ribs on sale at the grocery store - so I snagged those and let my brain figure out the rest. First I created a rub with some fajita-type of seasonings: cumin, chili powder, garlic, etc... Then I rubbed all the ribs with the seasoning and popped them in the crock pot. Instead of adding water - I used chicken broth for a little extra flavor. Be sure to not rinse all the seasoning off as you add the liquid. Four hours on high and your shredded pork is ready! While that's cooking - make up some Cilantro-Lime rice - just like your favorite burrito place makes - it's super simple! Chop up some delicious cilantro (it's super cheap - 50 cents for a huge bunch). Cook up your Minute® Rice (directions on the box) and add the cilantro and some lime juice - boomio! This rice is great on it's own or added to burritos, tacos, wraps, etc... - it just adds a little zing! And seriously - this pork is amazing - it's juicy and delicious. Plus the fat cooks out in the crock pot so it's that much better! My husband could eat rice pretty much any night of the week - so we always have Minute® Rice on hand - in five minutes - he's a happy camper - I'll take that any night. likes to just have the pork & rice plain - while I doctor it up into lots of different options. These tacos were so good and so light - you can really add whatever you like - if it's a little guac, a little sour cream, more veggies - whatever you like. Or if you're not a fan of pork - you can use chicken breasts! Or you can make it into a salad like I did today for lunch! Just as tasty! No matter how you make it - Minute® Rice makes it much easier! For recipe ideas and special offers from Minute® Rice straight sent to your inbox, join The Riceipe Club®. Heat tortilla shells in a skillet lightly sprayed with cooking spray. Once tortillas are heated through - build your tacos! Cook your Minute® Rice as directed. Once your rice is cooked, add the fresh lime juice, cilantro and salt. Stir well and set aside. Mix seasonings in a bowl and coat ribs on all sides. Place in crock pot. Pour 1 cup chicken broth around the pork (try not to rinse off all seasonings). Cook on high for 4 hours. Remove from crock pot and shred. And be sure to enter the giveaway to win a Kitchen Aid Mixer! !